Historical whisky research indicates BenRiach was the first distillery within Speyside to re-introduce peated malt into its whisky making back in the 1970s, a time when most Speyside distillers had moved their focus towards unpeated malt distillation. It is in this spirit that BenRiach Distillery is delighted to showcase its pioneering peated Speyside heritage by releasing BenRiach Temporis Aged 21 Years, the latest addition to the award-winning BenRiach peated range, winning a Silver Outstanding Medal at The International Wine and Spirits Competition 2017 and a Silver Medal at San Francisco World Spirits Competition 2018. The name Temporis, meaning ‘time’ in Latin, emulates the original character and flavour of Speyside malts in the nineteenth century. To create the new expression, Master Blender Rachel Barrie has expertly married together an eclectic mix of four casks: Bourbon barrels, virgin oak, Pedro Ximenez sherry and Oloroso sherry casks. 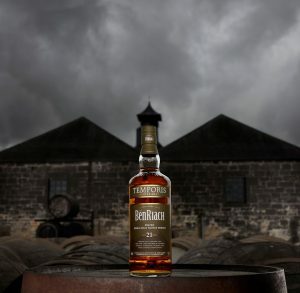 Temporis continues BenRiach’s reputation for rich, innovative cask maturation and perfectly complements its unpeated equivalent, BenRiach Aged 21 Years, also matured in four types of casks. BenRiach Temporis 21 Year Old is available to purchase worldwide from specialist retailers from June 2018, with an ABV of 46%, non-chill filtered and of natural colour.